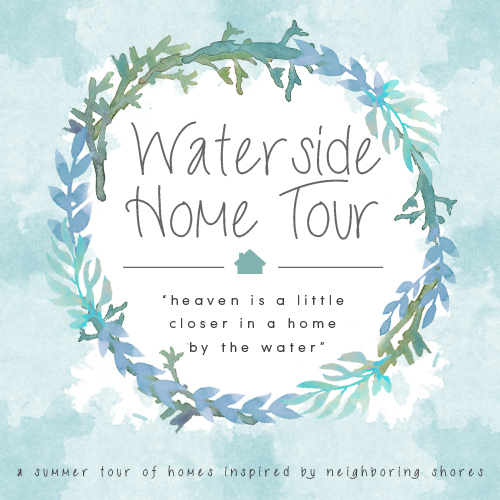 Today I am excited to bring you the first ever Waterside Tour of Homes, hosted by Emily at Table & Hearth. 15 other waterside living bloggers and I are taking part in the tour that will run Monday, Wednesday and Friday of this week. If you are coming from The Happy Housie or this is your first visit to my blog, Welcome! I am that person that you may know that gets very excited when driving along a road and sees a body of water. I just want to stop and sit on its banks. I am the one who walks to the end of a pier to get a better water view, I am also the person who you will see hanging over a ferry’s railing just so I can get a closer view of the water. I borrowed these words from the author of the book, Beach House Happy. I could not have stated my love of the water any better…they describe me perfectly. I feel a sense of happiness and serenity every time a body of water comes into view…there it is, like I have never seen it before. Being around water is where I feel my best and where I have always wanted to live. My astrological sign is Cancer – a water sign…it makes total sense to me. Six months ago, my waterside living dream came true when my husband and I moved to live in a house along the shores of Lake Murray, SC. It is a big lake that is 41 miles long x 14 miles wide with over 600 miles of shoreline. It is a man-made lake that came to life in 1930. There are very developed areas of the lake and very rural. My house is right in between. It takes 10 minutes to get into town where I do most of my errands and a few good places to eat. It takes 25 minutes to get to major shopping, movie theaters, and many more restaurants. Living in a house along the lake feels so right, as if it is where I was meant to be. We bought a boat with the money we were going to use to redo the kitchen, but it is well worth it. We use it all the time, even to go out to dinner. It is fun to pull up at a lakeside restaurant’s dock and then go in and eat. It is sometimes much faster to get to places around the lake on the boat then it is to drive. I recently kayaked to get to the place where I get my hair cut. Sometimes when I go outside with the sun shining and there is a gentle breeze blowing, it takes me back to simpler time in my life. It feels absolutely DELICIOUS! The house we bought is an older house that needs lots of updating in the way of decor. You can see the BEFORE, here. In the past 6 months we have made many improvements to start making the house truly ours. The biggest so far was making over a brick wall and fireplace to a stone fireplace and mantel that I made using the top of a china cabinet hutch that we no longer needed. Another bigger project was removing a wall between the kitchen and dining room. It was where the arrow is pointing in the photo. This opened up the space and doubled our water views from both rooms. We still are working on getting the patch on the floor completed. I find the fresh clean aesthetic of coastal decor inspiring, or how my favorite colors, combined with lots of white, can make me feel more cheerful, energetic, and refreshed. I love the light, the ease, the airiness. I want it to feel like I am living on a vacation. … and that is exactly how I am decorating this house. I don’t want any clutter around, even in my studioffice. I like to accent my love of white, by using blues, greens, and pinks in the decor. I also like to see a touch of black in every room, just a little to help accent the pops of color I love to add all around. Even though a lot of our time has been spent updating the house and making it our own we have had plenty of time to enjoy the lake and outdoors, especially now that summer is here. … as well as inside. I find I like to sit outside to watch the sunsets..
…and during the day, I have been bringing my laptop outside to work and love watching how the sun makes the lake sparkle like diamonds. I use my favorite colors outside, too. I planted pink verbena in planters that line the deck. Out in the gazebo that is over the water, I bring items from the house to make it more comfy. It is the perfect place to entertain and we have a few gatherings for family and friends planned for the summer. We still have quite a lot of updates to make to the house. Over the summer I will be finishing the staircase makeover, gutting the powder room, and banishing all the brown cabinets and trim in the kitchen. Even while I am doing all of these projects, I plan to take time to enjoy the water as much as I possibly can. Thanks for taking the tour. To continue on, head over to Karah at The Space Between. To tour the other bloggers coastal inspired homes, here are the dates and links. Enjoy! Your home is quite charming. We had a summer cottage on a lake in Maine and I definitely know why you are enjoying your boat. There is something special about watching the sunsets with the reflections on the water. So happy to have discovered your lovely blog. Hi Karen – Thanks for the nice note. Maine is one of my favorite places to go. It is such a gorgeous state. I told my husband that I want a tiny little dish pan size boat with a motor so I could explore all over the lake and use less gas then the pontoon boat uses. I could stay out on the water all day. :-) Thanks for connecting with me and reading my blog. Thanks Krista – It will be a hot and humid the next 2 months and so far we are enjoying the fact that when we are feeling the heat, we can just jump in the water to cool off. Even with the water temp of about 87 degrees, it feels refreshing and I come out shivering since there is always a breeze blowing. What is the water temp in the summer on Sproat Lake? I had to use a centigrade to fahrenheit converter online to answer this question:) LOL. The outdoor air temperature here in the summer generally ranges from 77 up to 95 – but the water temperature is probably around 68 in the summer. If it gets beyond that, we think we are swimming in some good old fashioned french canadian pea soup;) And our humidity is generally fairly low, I would say (compared to what it was like when I visited the southern US- which was only Atlanta). Oh my gosh, that hammock looks like the PERFECT spot for an afternoon nap. Such a beautiful home and property. Pinning and sharing! What a magnificent lake home! Every detail is decorated perfectly. I enjoy the water views.Glad I stopped by, so inspirational. Hi Maria – Thank you. We have been busy doing improvements to make the house our own and enjoying every minute. I am looking forward to your tour on Friday. Hi Heather – Thanks. I still can’t believe we made living along a lake a reality. I am enjoying making it my own and having fun doing it in affordable ways. Looking forward to your tour on Friday. I grew up near the Long Island Sound and took the wonderful briny smell and fog horns for granted. I love being near the water but never felt called to live at the beach. A lake house sounds divine or if I had the money, a place on the sound. Your place is really coming together so nicely. Hi Liz – Living near the Long Island Sound must have been wonderful. We looked at a The Abamarle and Pamlico Sounds in NC with great views, but ended up liking more about living on a lake. I think I am going to be using the Gianni or the Spread Stone, too for my counters. Not sure which yet. If you do it soon, I would love to hear your thoughts on using it. Gorgeous tour! You have done some amazing work in just 6 months! Enjoy the water this summer and I can’t wait to see your future projects. You are truly living my dream too. How cool is it to kayak to get your haircut. I’m getting mine cut today and driving there through the Lehigh Valley is lame ;) Everything you have done to the inside looks wonderful too. Beautiful tour Diane! I understand how you feel about the water, as I feel that way about the mountains and pines. I’m so glad you found your water side home and are working to make it your own style! Those views are amazing Diane, and y’all have done so much awesome work to the house! I’m so happy you were able to join us on the tour, thank you!! Loved the tours. You’re living my dream! I LOVE it. What a great place to spend one’s golden years. I always look forward to your “update” posts. Thank you for sharing some of your life with us. I would have used the kitchen update money for the boat too! I love being on the water. The rest of the house is absolutely gorgeous – the kitchen will get there after boating season is over Love the house and what you’ve done. Your house and property are spectacular Diane and Ed!!! So beautiful. I love everything about your home and property. I forget if you told us, but where can I find your bedside clock?